If you’ve been following the blog, you know that I’ve been obsessed with finding the perfect paint colors for the house. Now that the wallpaper was off and the hardwood floors uncovered and cleaned, it was time to paint. I’d already met with Tim over at Shelby Paint, but now I had to put our selections to the test. 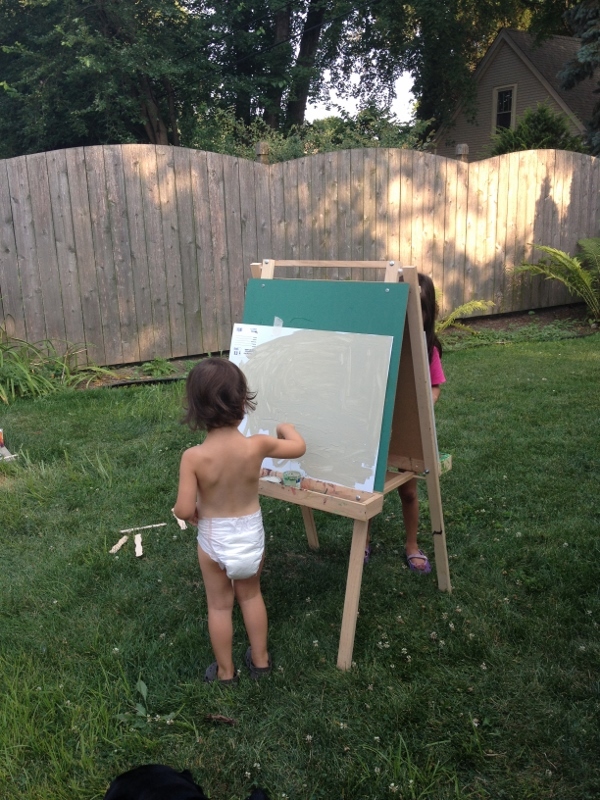 I bought a bunch of samples and let the girls help me paint poster boards (as you can see, the above pic was taken a while ago – Lucy is still in diapers and we’re still at the Apartment), which they were thrilled about. Then I took the boards to the new house to check them out. Color is a very tricky thing, as I have learned over the last couple months. I knew it already, but wow. Colors change from one room to the next, from one foot to the next even, sometimes. And of course they change drastically depending on how light or dark the room is. Initially I’d picked Athena for the entryway (the largest of the samples above), but now it appeared too blue. We (meaning me, as my husband was rolling his eyes at this point) decided to go with Manchester Tan instead, the darkest color shown above. 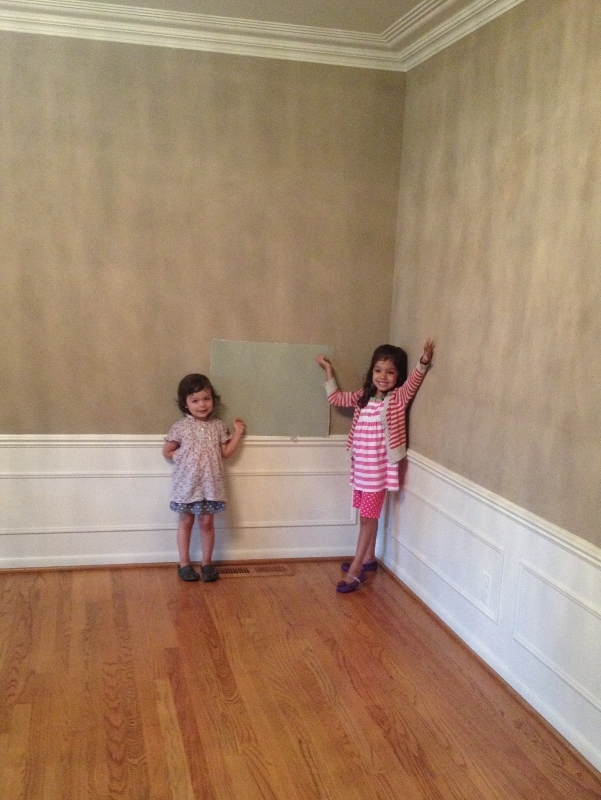 Our dining room pick, Nantucket Grey, was perfect. And for the living room, we were originally going to go with Athena as well, but again, it looked too bluish. I really wanted a light, airy feel to the living room, so I went with the controversial Navajo White (poster board is Athena). 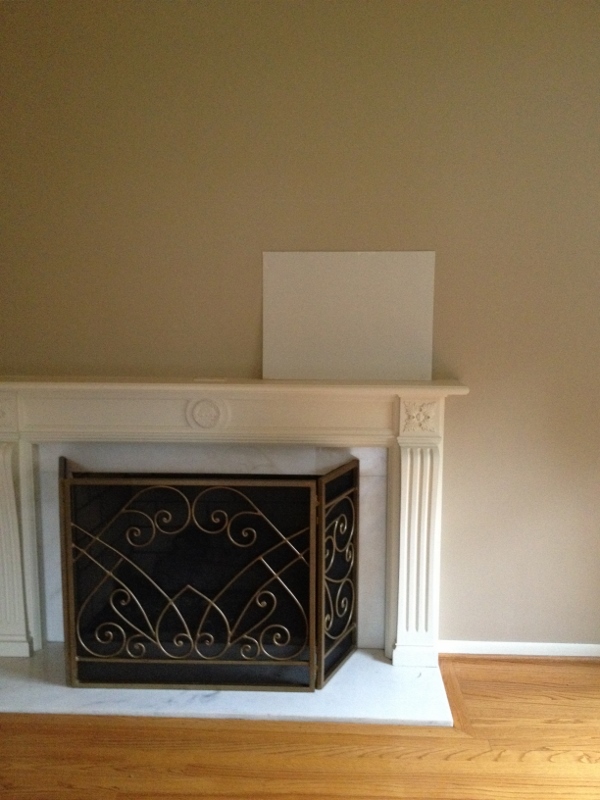 Before selecting a white, I went online and read various reviews from both experts and DIY folks. Many experts poo-pooed Navajo White, saying that it felt too “rental apartment” or boring. But that Linen White was a beautiful white. Anyway, I looked up Linen White, and it is seriously almost exactly the same formula as Navajo White. So there. And I went with the old design rule (whose rule? I don’t know, but I’m sure it’s a rule), if you like it, then who cares what anyone else thinks? COMING UP: In my next post, I’ll introduce you to John, our painter, and reveal my one color regret. Can you guess? 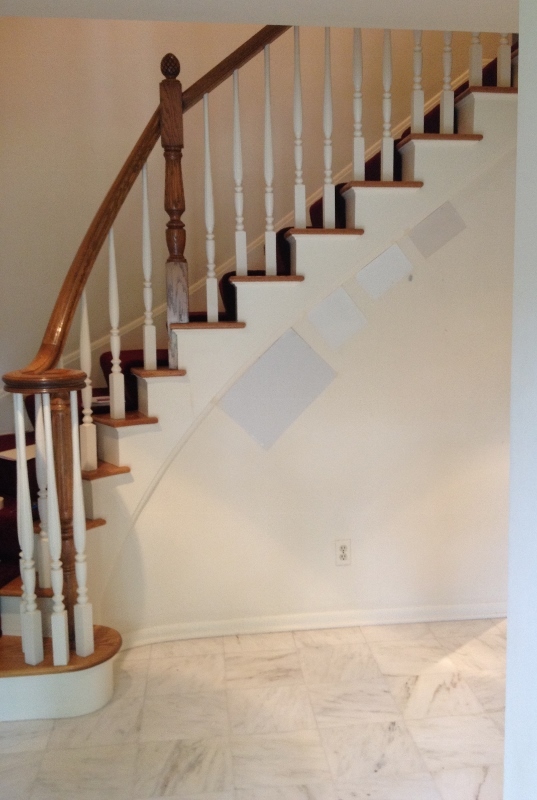 This entry was posted in Grosse Pointe, Moving and tagged Color, Home Remodel, Home Renovation, Moving, Paint, Walls. Bookmark the permalink. ooh, a cliff hanger. please, next blog–i can’t wait! Looks like a beautiful home, and the colors look wonderful!! Your little lady is already modeling i see, so cute! !